“…pure sweetness in a very readable package, perfect for those who like their romance gentle, G-rated, and family-style.” - Publisher’s Weekly“…a delightful story…” - RT Book ReviewsLacy Williams is the USA Today bestselling author of the acclaimed Snowbound in Sawyer Creek and Cowboy Fairytales series. 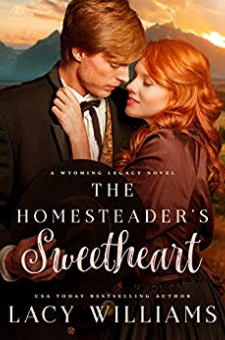 About THE HOMESTEADER’S SWEETHEART:Pursued by an unwelcome suitor, banker's daughter Penny Castlerock will do anything to escape town and Mr. Abbott's advances-even visit her grandfather's homestead for an undetermined amount of time. Out of her element, she must rely on neighbor Jonas White and his brood of adopted children.Scandal chased Jonas out of Philadelphia five years ago. A scandal that socialite Miss Castlerock knows about. Since then, Jonas has kept to himself, worked his homestead, and focused on raising his seven adopted boys and his daughter. The last thing he needs is to be reminded of the past and the young woman he once fancied-especially when she's so far out of his sphere...As circumstances force the two to work together, their tentative friendship blossoms into something more. But can two people from such disparate backgrounds find true love with each other?One family will brave the wilderness of Wyoming to fight for their livelihoods… and for love. The Wyoming Legacy series includes these books:1. The Homesteader’s Sweetheart2. Roping the Wrangler3. Return of the Cowboy Doctor4. The Wrangler’s Inconvenient Wife5. A Cowboy for Christmas6. Her Convenient Cowboy7. Her Cowboy DeputyThis book was originally published in 2012 by Harlequin's Love Inspired Historical series line.Genre: Christian historical romance Length: novel (290 pages)Read all the novels by USA Today bestselling author Lacy Williams:Wild Wyoming Hearts series1. Marrying Miss Marshal2. Counterfeit Cowboy3. Cowboy Pride4. Courted by a CowboyA Sawyer Creek Homecoming1. The Bull Rider2. The Brother3. The Prodigal Jilted in Sawyer Creek1. Someone Old2. Someone New3. Someone BorrowedSnowbound in Sawyer Creek series1. Soldier Under the Mistletoe2. The Nanny’s Christmas Wish3. The Rancher’s Unexpected GiftCowboy Fairytale series1. Once Upon a Cowboy2. Cowboy Charming3. The Toad Prince4. The Beastly Princess5. The Lost Princess6. Kissing Kelsey7. Courting Carrie8. Stealing Sarah9. Keeping Kayla10. Melting MeganHeart of Oklahoma series1. Kissed by a Cowboy 1 & 22. Love Letters from Cowboy3. Mistletoe Cowboy4. Cowgirl for Keeps5. Jingle Bell Cowgirl6. Heart of a Cowgirl7. 3 Days with a Cowboy8. Prodigal Cowgirl”Williams delivers a smart, gentle, and uplifting novel.” Publishers Weekly on RETURN OF THE COWBOY DOCTOR.”It's the kind of story you want to curl up next to a fireplace with on a snowy Christmas Eve.” WendyTheSuperLibrarian book blog on A COWBOY FOR CHRISTMAS.”…a gentle, family-friendly success.” Publishers Weekly on THE HOMESTEADER’S SWEETHEART.